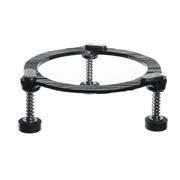 This reaction vessel clamp for O-rings and flat flanges is a cast bronze ring with a black oxidized finish. 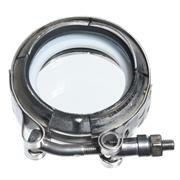 Three insulated, spring activated clamping arms fit beneath the flange of the flask body. Simple pressure on the heat-resistant fiber knobs and a twist, permit attachment or removal. These PTFE/Viton® couplings provide an inert and greaseless connection for equipment with beaded fittings. Their unique design eliminates pressure points which cause glassware to break. Use with LG-4553 and LG-4558 beaded ends.